Aren’t the colours beautiful? When I saw this recipe on TV3… I knew I would try it at home! I’ve been waiting for nearly 3 weeks to do it because the original fish used in the recipe was Red Mullet but my fishmonger couldn’t find it anywhere, and so, I finally gave up and used fresh sardines instead (they are in season in full flavour/taste). Isma Prados , a Catalan chef, has his TV program, on tv3, every Saturday and Sunday at 8:30 pm. He is quite a character: thin, nervous, smart, quick, and a great cook among other things. But what I really enjoy from his recipes are all the explanations behind: he always answers all the whys that come to my head… he’s very didactic and amusing :D. This recipe is an adapted version of the one I saw in his program. This is not the kind of recipe I normally cook at home but some of its features convinced me to go for it. See the sardines structure? This little tower made me think about the human towers we practice here during some special holidays. Would you like to see what I’m talking about? Tarragona is one of the regions here in Catalonia (down south from Barcelona) where there’s a big extension of vineyards. Some of the best catalan cavas and wines are cultivated here, such as Freixenet, Torres or Gramona just to mention a few. 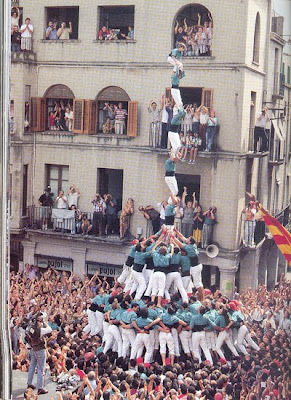 This region has also a deep and ancient tradition in building human towers: Castells. These are complex human towers where the stronger, older and wiser stay in the bottom layers and the younger and lighter climb up top levels. Usually the top of the castle is reached by a very young girl or boy. He or she will then raise one hand up… the crowd will cheer and shout and clap like crazy and then little by little the castle will be deconstructed. If they are able to undo all the work and the deconstruction is successful, then the crowd goes nuts!!!! Nowadays it’s compulsory to wear a protection helmet to be part of the Castell. There’s many kinds of castles and with different difficulty levels. This one hereunder, for example, was accomplished on August 31st of the 95. Look at the people :D. They are so happy about it! Last time a tower like this was achieved was back in the XIX century!!!! Let’s go back sailing sardines in our red strawberry sea. Ingredients for 4 servings: 12 fresh sardines (depending on your ability to build the tower), half a kilo of fresh strawberries, half a teaspoon of herring black eggs, 3-4 slices of Iberian acorn ham (cured ham would be ok here), 6-8 dices of ham, 1 teaspoon of hot red paprika, olive oil (0,4º) and some bread croutons. First of all, place a pot or a sauce pan over the heat. Have it at the lowest possible and place the ham slices. Let them get crunchy and reserve. Add some olive oil in the same sauce pan and confit (don’t know if this is the right word. I mean to simmer in olive oil and don’t fry it) the ham dices for 2 minutes aprox. Take the sauce pan outside the heat and pour the hot paprika, stir, add some more olive oil (in total you should have nearly one centimeter depth) and back to the heat (medium). When it starts getting hot add the sardines with the skin up and let simmer for 3 to 4 minutes (watch carefully that they don’t get fried, the heat should be the lowest possible). Once confited take from the sauce pan and place over kitchen paper to leave all olive oil there. 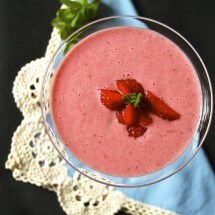 Clean and wash the strawberries and with the help of a food processor convert them into a juice. Take their seeds of (I used a fine strainer). 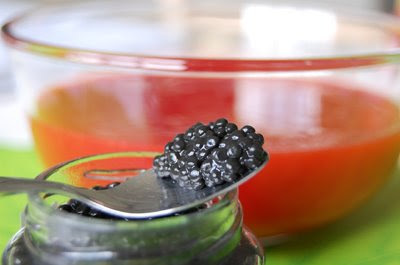 Take the herring black eggs and pour into the strawberries sauce. Stir and reserve. Use the ham sauce pan with the same olive oil to fry some bread croutons. Place over kitchen paper and reserve. To serve the dish: Build a tower with the sardines loin (half a loin for level is fine) and place the crunchy ham slices in between. Pour the strawberry sauce around and place the croutons over the dish. I didn’t use any salt in this dish because the ham gives enough flavour to it… but then… that’s always your final decision :D Enjoy it!!! 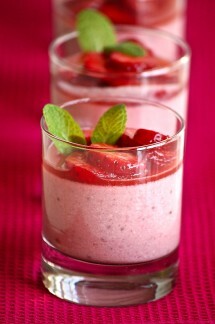 I’m sending this recipe to Cookthink to the Root Source Challenge#14: Strawberries. There’s still some days left to post your recipes, go and check! A really interesting recipe – I’d love to try it. Ahh, now this recipe makes sense…it’s meant for red mullet, which pairs well with sweeter ingredients. 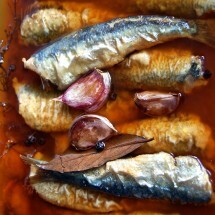 I would have held off on using sardines, they are a bolder little fish. Regardless chica, you took the challenge and presented a beautiful plate. Hola Kittie! Welcome to Spanish Recipes :D. So happy you like it! 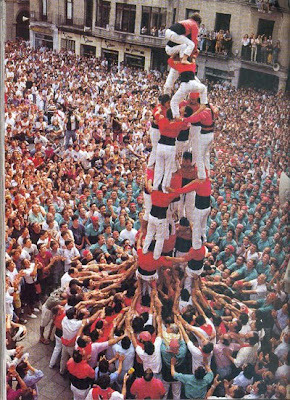 And concerning human towers, these are only pictures, if you see them right there in the square your hair raises!!! Daring flavors. I see you substitured the sardines due to the availability of mullet. You are correct, the whole presentation is stunning. I cpould see that at some 4 star place her in Chicago.Have a great weekend ! I love the presentation of this Nuria…oh so cute! And your pics are just stunning (con nueva camera?). Those human towers are hilarious! Aunque yo nunca he visto esta combinación de pez con fresas, me encanta tu foto, en fin, todas las fotos! i love the human towers! none of these ingredients are things i would have ever put together, but the final product looks lovely. What a fascinating recipe! And the information about Castells was, too! I would be so frightened – I don’t like heights. Nuria, I never fail to learn something fabulous when I visit you! Very interesting recipe Nuria. 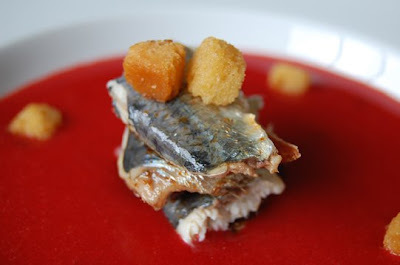 This is gourmand food even with the sardines. Hola Memories in the baking! Welcome :D Muchas gracias por tus palabras tan amables. Me encanta que te guste! Hi Michelle! Welcome to Spanish Recipes :D. I wouldn’t have thought of having them together… but I saw the recipe on tv and thought it was beautiful! Thanks sweet Jen :D I would never let my daughter be part of a castell, but I love to watch them!!! Yes Ivy… it looks gourmand but I did it so it’s as gourmand as I can be ;-). It’s a question of colours and space… I think :D.
Like we said in our morcilla stuffed squid post, the spanish do meat and seafood combos better than any other culture i know. THIS IS BEAUTIFUL NURIA!!! And tasty-looking. Wow! I’ve seen small towers… that is/was truly amazing! 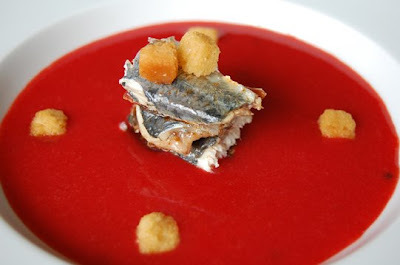 I’m trying to imagine the strawberries and sardines… I love sardines (had some for lunch) and ham with any fruit…. Nuria you’re so clever! I find your strawberry red sea idea purely genius! oops! i wrote that on the wrong one. you understand. :§ oooops!